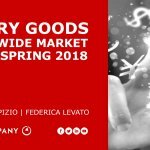 estudio mercado mundial lujo, primavera de 2018 rsector del lujo Bayn. Results and trends of the luxury sector in the world. This study was prepared by Claudia D’Arpizio and Federica Levato for Bain & Company in the spring of 2018.